Gen (a.k.a. 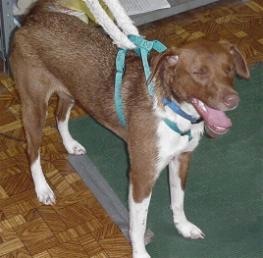 “the escape artist”) was adopted from Carolina Border Collie Rescue. 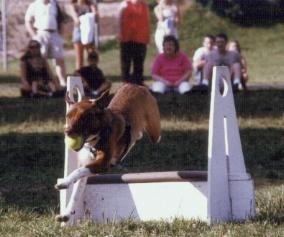 Gen was the first flyball dog I ran that actually belonged to me. After years of box loading, judging and running teammate’s dogs, she came along. She took 2 years to train because she was afraid of the box; but when she finally got it, she got it! Once she started racing she never had a single problem. 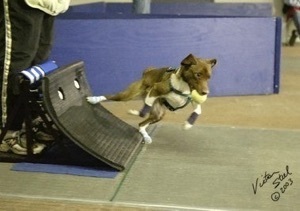 Her flyball career was short but productive. She ran as a height dog, a start dog and could fill any position in the lineup. Running second after Lynn Smith’s Keeper was always funny. Anytime Keeper (or the opposing dog) had a false start I used to have to back up because she was so mad that Keeper got to run twice before she did. Gen dug in even harder. Gen became a solid dog that would run for anyone she knew that held her tug. She got her FD at NSL’s June 2001 tournament. She was retired from racing because of spondylosis. Her last tournament was DGF’s in January 2006 and she retired with 52,634 points. Gen and I were the very first recipients of ODTC’s “Sidekicks” award for the outstanding ODTC flyball dog and handler of the year.